From overcrowded airports and flight cancellations to lost luggage and baggage fees, the hassles of holiday-season plane travel can appear endless. The last thing you want to worry about when traveling for the holidays is being struck with a bout of jet lag after successfully arriving at your destination. Read on to discover just what jet lag actually is--and how you can prevent it. The Mayo Clinic defines jet lag as “a temporary sleep disorder that can affect anyone who quickly travels across multiple time zones." According to the Mayo Clinic, your body has its own internal clock (referred to as circadian rhythms) which signals when it’s time for you to be awake and when it’s time for you to be asleep. When jet lag occurs, it’s due to your body being synced to your original time zone, rather than to the time zone recently entered. Am I Likely to Experience Jet Lag? The more time zones you cross, the more likely you are to fall victim to jet lag. Eastbound passengers may be more likely to experience symptoms than those flying west, since time tends to be “lost” for those heading east. Finally, symptoms of jet lag are more likely to present themselves to older adults and frequent flyers. How Might Jet Lag Affect Me? Symptoms of jet lag include insomnia, daytime fatigue, difficulty concentrating or staying alert, gastrointestinal problems, mood changes, and a general feeling of discomfort. According to the Mayo Clinic, symptoms usually occur within one to two days of travel, and jet lag recovery is likely to amount to one day for each time zone crossed. Thankfully, jet lag is just a temporary condition, though it certainly has the potential to disrupt your holiday vacation. Can Jet Lag Make Me Sick? Dr. Rachel Vreeman, assistant professor of pediatrics in the Children’s Health Services Research Program at the Indiana University School of Medicine, says that our bodies can react to extreme fatigue with nausea, vomiting, and diarrhea--all of which “can also be symptoms of jet lag.” She notes that exhaustion is more likely to lead to vomiting when combined with a significant time difference and/or stress. Not only can being sick ruin your holiday vacation, but it can put a huge strain on you financially. Should you need to visit the doctor or go to the hospital, the medical treatment for your illness could cost up to hundreds--or even thousands--of dollars. 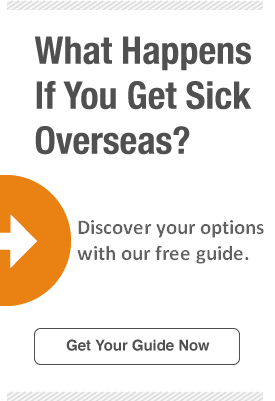 Since your standard medical insurance policy is unlikely to cover you beyond the borders of your home country, a customizable plan like Atlas Travel® can provide you with access to quality care and financial help if the unexpected strikes during your international holiday vacation. The sooner you start planning your holiday vacation, the more options you’ll have when it comes to flights. If an overnight flight is available, go ahead and book it! Not only will you be more likely to fall asleep than you would on an afternoon flight, but you’ll be able to have dinner at a normal time and you’ll likely arrive in the morning or afternoon. For these reasons, your body will have an easier time resetting your internal clock. Fodors.com recommends that you gradually (at least four days before departure) shift your sleeping and eating schedule to coincide with typical sleeping and eating times in your destination city. For those heading east, FareCompare CEO Rick Seaney recommends going to bed one hour earlier each night for the few nights prior to your departure. For those heading west, he suggests going to bed an hour later each night for the few nights prior. Avoid the coffee stand nearest your terminal. At least 12 hours before your flight, as well as during, try to abstain from ingesting coffee and caffeine. Though it may provide you with a short period of alertness and stimulation, it’s often followed by a drop in blood sugar. According to StopJetLag.com, this drop essentially “rob[s] your body of available energy reserves.” Caffeine can also make you wake up more often once you do fall asleep. The day of your flight, consider moving your watch ahead or behind to sync it with your destination time zone. This will help mentally prepare you for a significant time difference. According to the Mayo Clinic, dehydration can contribute to the severity of your jet lag symptoms. Since humidity levels are low in planes, it’s important to drink plenty of water throughout your flight in order to combat dehydration. Fodors.com recommends drinking at least 8 ounces of water for every hour you’re in the air- even when you don’t feel thirsty. It also suggests packing TSA-compliant moisturizer and lip balm in your carry-on bag. Sleeping on the plane can be beneficial to those flying west to east or overnight. Since travel can take a toll on your body, this rest will prepare you to deal with the symptoms of jet lag that may come later. If flying first class isn’t within your budget, opt for a seat in the emergency aisle (more leg room) or a window seat (so you can prop your head against the wall). Avoid the rear of the plane if possible, since those in the back will get the brunt of any turbulence, and be sure to pack a pillow and blanket. You may also wish to carry on noise-canceling headphones, ear plugs, and a sleeping mask. There are several inexpensive- or free! –natural remedies for preventing and combating jet lag. Check out our top three below. Melatonin is a natural hormone (also sold as a supplement) that helps to regulate the body’s sleep-wake cycle. According to Health.com, some experts recommend taking melatonin after dark on the first day that you travel—and for a few days thereafter—in an attempt to fight jet lag. If you are flying east, you may wish to take a melatonin supplement in the evening for the few days before your flight. While melatonin is an over-the-counter supplement, you should still consult your doctor before taking it. Lavender oil has been proven to promote and enhance sleep. Sara Altshul, remedies expert at Health.com, says that she overcomes insomnia while away from home by sprinkling a few drops of lavender oil on her pillow, leaving her instantly relaxed. Not only can lavender oil help you fall asleep quickly, but unlike many over-the-counter sleep enhancers, it can help you awaken feeling refreshed. The Mayo Clinic calls sunlight “the most powerful natural tool for regulating the sleep-wake cycle.” If you’re traveling eastward, exposure to morning light can help you adjust to your earlier time zone. If you’re traveling westward, exposure to evening light can help you adjust to your later time zone. To adapt to your new time zone even faster, try combining light exposure with exercise.